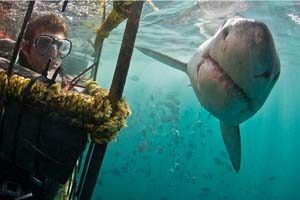 Meet Courage, the great white shark paving the way for exploration. The aptly named Courage has been a pioneer in exploration ever since he was little. Now a mature adult, he’s got something to say about uncharted waters. Tagged by Ocearch in 2012, Courage has spent more time “on the road” than almost any of the other sharks from his hometown of Struisbaai. He is revered in his community as a trailblazer; one who explores new frontiers and creates new norms. A natural trend-setter, Courage was one of the first South African great whites of his generation to explore the unchartered waters off the eastern coast of Madagascar, a notoriously long and arduous journey from the humble coastal waters of the Western Cape coast. His endearing enterprise and resourcefulness has earned him the coveted nickname of “Courage Columbus” after the famous Italian explorer Christopher Columbus who is credited with discovering America. Courage now hopes to win other sharks to his way of thinking when he makes the long journey back to his home town of Struisbaai towards the end of the year. He won’t be home for long though as he looks to take on another great adventure. The Southern Ocean, he believes, may be his next frontier. Catch Courage on your next shark cage diving tour but be sure to act quickly because your chance to catch this wiley old veteran may be running out. Book your next shark cage diving experience in Cape Town with Shark Bookings today!